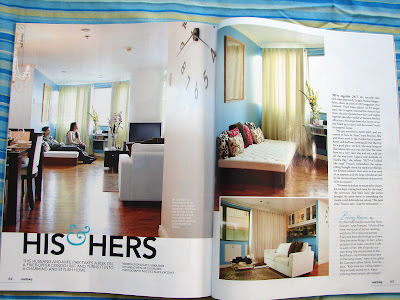 TOPAZ HORIZON: A thousand thanks to Real Living, Nuffnang and Table for Three! 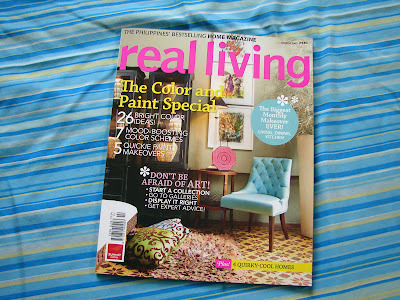 A thousand thanks to Real Living, Nuffnang and Table for Three! Did y'all see my giant wall clock in the hallway? The strangest thing is it's so huge no one sees it! It took me about a week to install it, checking with Greenwich time to make sure my numbers were perfectly placed. The daybed (and lots of other things in the house actually) is Vince's parents' wedding gift. The lovely antique Italian mirror in the dining room is my parents' wedding gift. 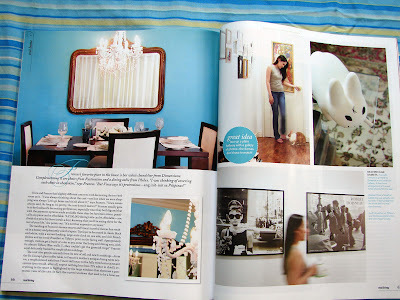 The white chandelier--which is the first thing everybody sees--is one of the first things Vince and I bought as a married couple. We didn't even have a house yet when we bought it so naturally, the design for the apartment revolved around the chandelier! To prove this is really our house, here's a zoom in. Close up of the rabbits in Casa Cunejo. Boy, everybody told me I looked fat in this photo... and I do! The other fattie is Galadriel trying to get into the bedroom because she was camera-shy. On the right is Vince. Literally. A smoking rabbit with stubble. Haha! 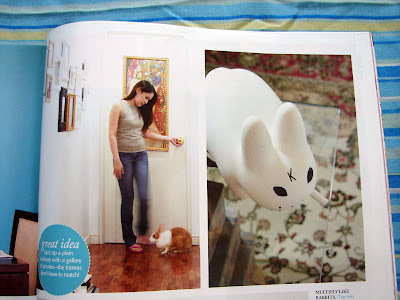 Actually, it's a designer toy called Smorkin Labbit by graphic artist Frank Kozik. We saw it in a store window but we were told it wasn't for sale, that it was part of the store's decor. Well, that don't stop me, sugar! Ten minutes later, Vince and I were dusting it off and we had a new toy. The glass coffee table it's standing on is a truly gorgeous design from BoConcept. This is Vince's Christmas gift to me, by the way. It's a Prizmic & Brill New York leather and brass studded writing desk. Remember how I've been looking for a desk for so long? Well, my husband went over and beyond my expectations and when he bought me this beauty, I just screamed my head off. 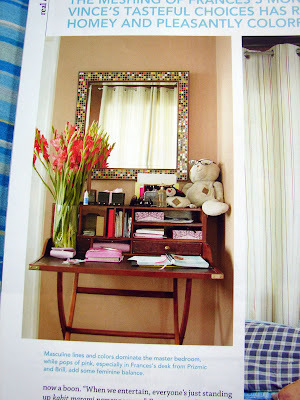 The exquisite colored-glass mosaic mirror above my desk is from Tessa Prieto Valdes. So sweeeeeeet of Tessa! She had this shipped from I don't know where just because I saw it, said I liked it and she ordered one for me pronto! Thanks, Sea Princess! Anyway, the apartment is still a work in progress. We're still hunting for lamps and an accent chair for the living room, a buffet table to put under the giant clock in the hallway, rugs and carpets, have a shoe cabinet installed and... oh so many things! Vince and I love to decorate but we do it slooooowly. We both have to fall in love with a piece first and check if we can pay for it and when those conditions are met, then game! A home is so much fun. 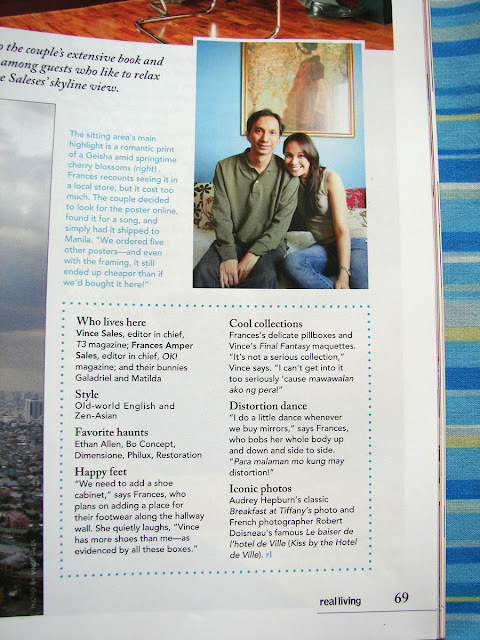 Oh, and I'm also Nuffnang's Featured Blogger of the Month! And I'm a guest blogger at Table for Three! This is AMAZING! Congratulations a thousand times! Also, my tiny Labbit sends his regards to yours. Congratulations Frances! The design is exquisite :) I like it! nice. ANd cute rabbit you got there hahaha. Kita tyo minsan ha. Nga pala, just in case you're anywhere close, I will be in Bioessence Greenhills sa Thursday, 5PM. Getting a beauty treatment. Miss you! We have to see each other soon. Hey, I just remembered that discussion we had about lamps and I couldn't quite remember the name of the store near our office. I think it's Luminesce. :) Haven't been there but the stuff I see through the window look promising. You could also try The Room Upstairs at LRI. WendyB, my Labbit returns the greeting! Cris, I really do hope there are still copies available! Jen, yes, that's the famous wall clock! Yes, I think you come up with the best blog names ever! And yes, we will see each other soon! Tisha, I've been meaning to drop by at Reliance but I always get so lazy because it's just... there! SusannahC, Fabulus, Jori, Dong, Jehzeel, thanks!!! oh, and i love that clock! Nel's Bebi, thanks! I love your house, too! And ibang klase rin kayo ni Arnel--as in super DIY kayo! Well, ganyan naman daw talaga sa Staes, no?